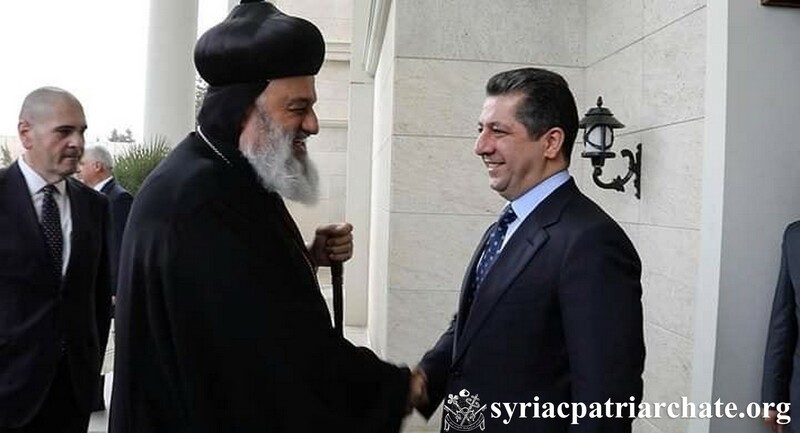 On January 27, 2019, His Holiness Patriarch Mor Ignatius Aphrem II met with His Excellency Masrour Barzani, Chancellor of the Kurdistan Region Security Council in Iraqi Kurdistan. His Holiness was accompanied by their Eminences: Mor Nicodemus Daoud Sharaf, Archbishop of Mosul, Kirkuk, Kurdistan and Environs, Mor Gregorios Saliba Chamoun, Patriarchal Counselor, Mor Severius Hawa, Archbishop of Baghdad and Basra, Mor Justinos Paulos Safar, Patriarchal Vicar in Zahleh and Bekaa, Mor Timotheos Moussa Al-Shamani, Archbishop of the Archdiocese of Mor Mattai Monastery, and Mor Timotheos Matta Al-Khouri, Patriarchal Vicar for the Patriarchal Archdiocese of Damascus, as well as Very Rev. Raban Joseph Bali, Patriarchal Secretary and Media Office Director. His Excellency President Barzani welcomed His Holiness. His Holiness thanked His Excellency for supporting Christians in Iraqi Kurdistan. They spoke together about the important role of education in promoting tolerance and openness against extremism and terrorism. They also discussed the general situation of Christians in Iraqi Kurdistan and the help that the Regional Government has provided to Christians since 2014.